I use small drawer units like these on top of the table top to hold most of these items. It's handy and keeps the visual clutter down. I also keep my current DT stuff on my table top in baskets (those 3 baskets to the left). I also keep a couple of Ott lights on the table top for detail work. These lights give off really good natural light which is nice when you're working with colors. They can be pricey, but DO NOT pay full price. They frequently go on deep sale at Joann's or Michael's. Speaking of natural color, it's the reason the walls in my craft room remain white. There's so many colors going on in the room as it is, adding another wall color was too much. And I like that the color of my projects are not tinted by the surrounding color. Since last fall, I've added the Michael's shelf on the left. 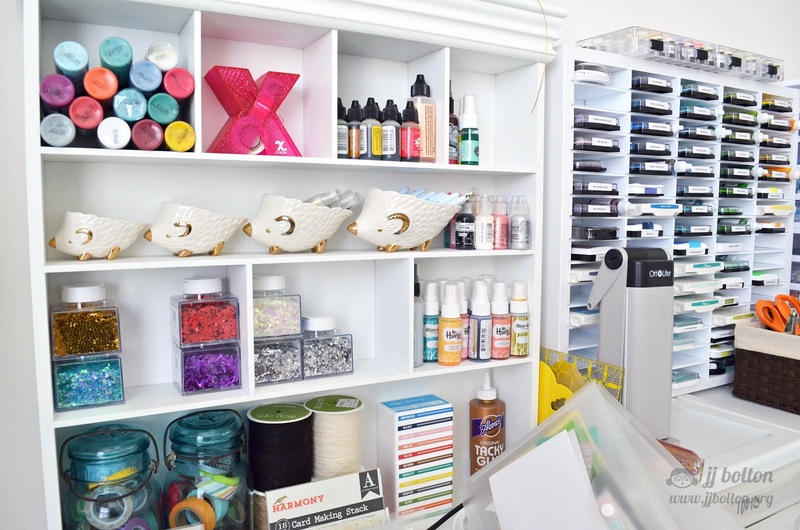 It balances the ink storage and gives me a place to store things that are best standing up like inks, sprays, glues, etc. 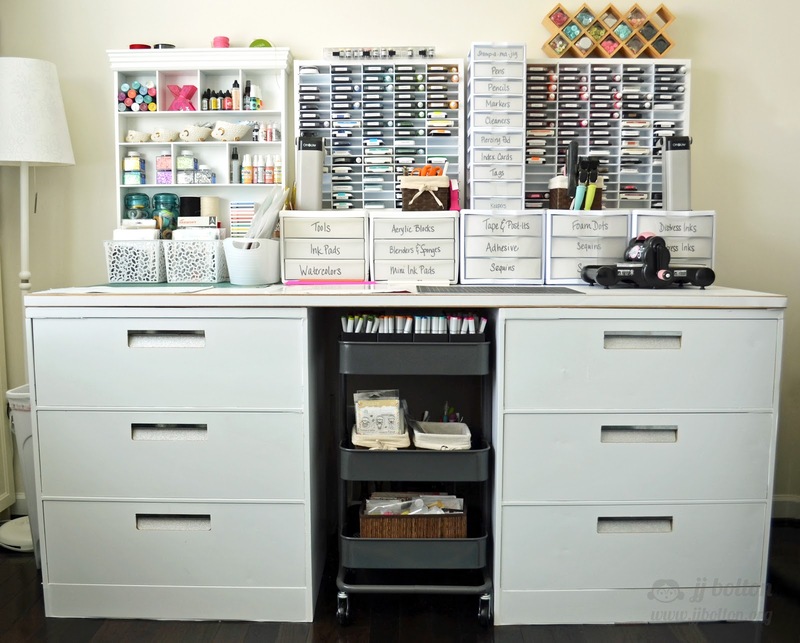 The Organize More inkpad holders were my one big splurge in this room. I waited for a sale (buy two with a discount) and they are worth every penny! They fit most types of inkpads and I can even get a reinker in each cubbie as well. 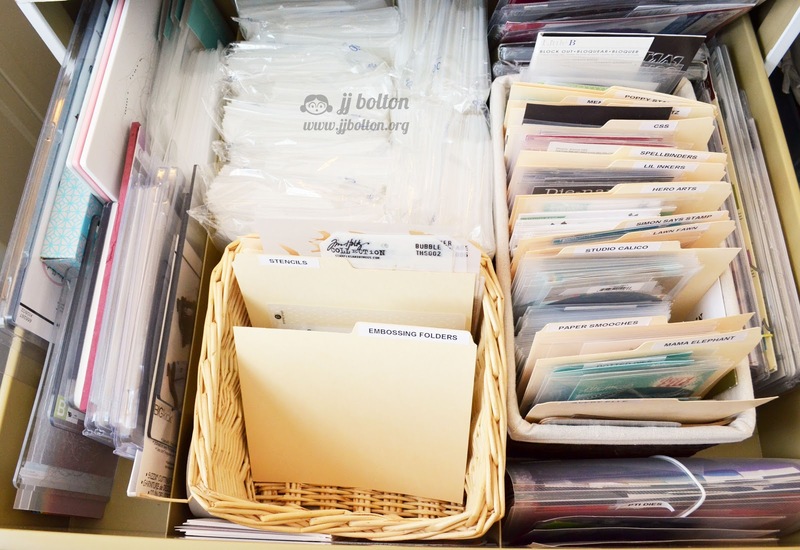 Over the past year, I've also picked through and reorganized each drawer below the work table. Let's work through the cabinet drawers now, shall we? The top left drawer used to look like this and it is mostly the same with a few additions;) Dies are my weakness and I've added a few over the year (just a few;). I've also added a few stencils which are a new thing for me! 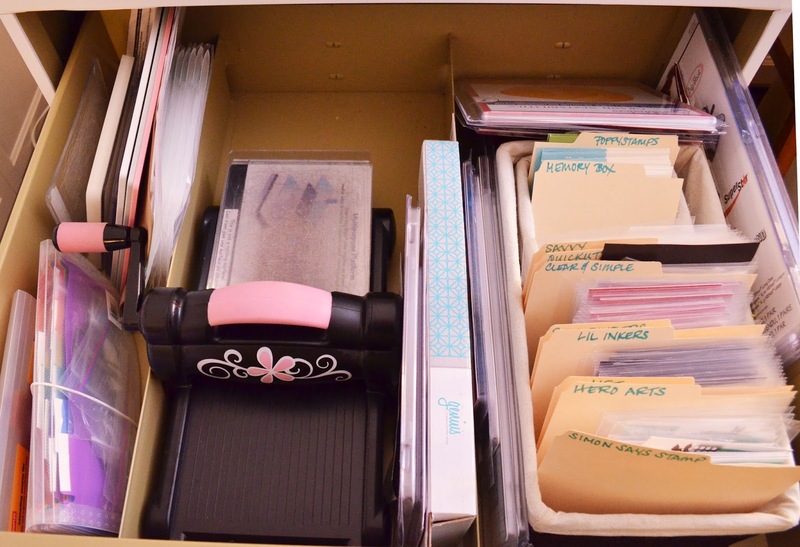 This drawer is also where I store my Avery Elle stamp storage pockets and my new smaller stamp/die pockets (I'll show you those tomorrow). I keep most of my dies in the small pockets, but I do have a bunch of loose PTI dies that I store in a small accordian folder like this. I keep those separated by category (like flowers, home, office, words, etc.). I used to keep dies on a a large magnet board, but I like having them categorized and with the maker's info. The bottom left drawer was empty last year and now contains what's left of my punches. 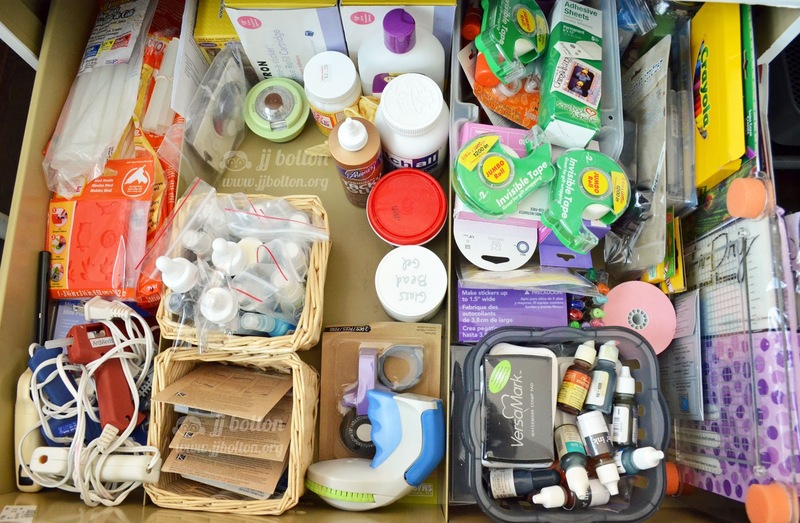 I've gotten rid of quite a few of those, but there are a few I still love and can't get rid of:) This drawer also contains my most-used embossing powders in dollar store plastic containers. Using the containers really helps make the embossing powders last since you never have to throw out the excess. 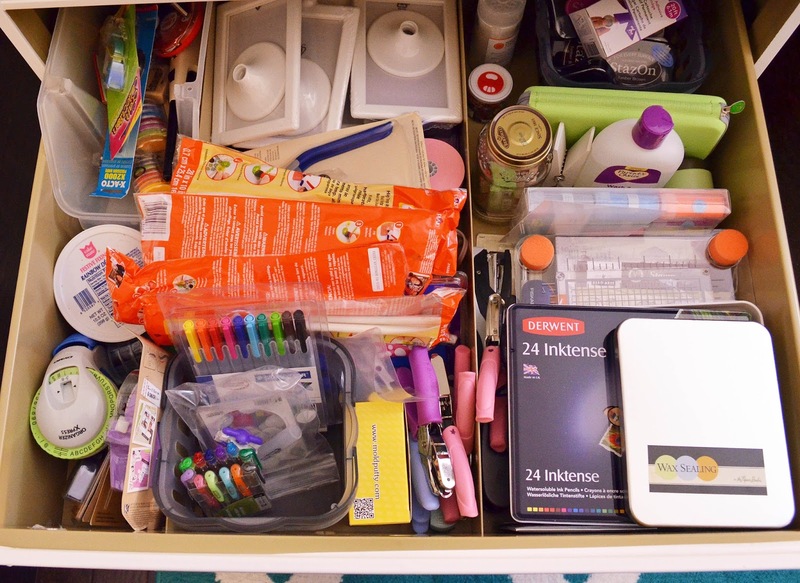 In the right side cabinet, the top drawer used to look like this. It's since been picked through and cleaned up quite a bit. 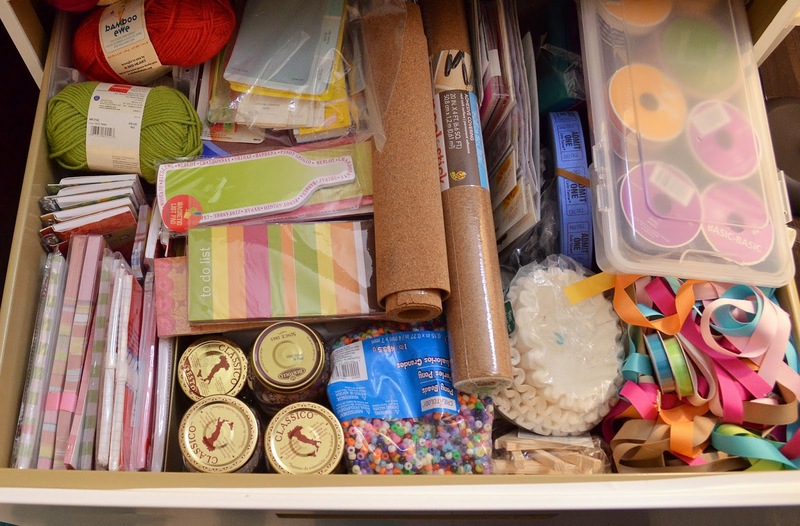 As you can see, this is my embellishment drawer with enamel dots, rhinestones, threads, washi, wood veneers, and other little bits and bobs. When I was reorganizing, I noticed that I had a lot of lovely things but many were not my style. Now I try to resist purchasing just because things are pretty! I have to think about what I'll actually use:) As for the extras, I'm lucky that I have two little nieces who have no qualms about using every supply! I thought it would be hard letting go, but it's fun to see the supplies get used! 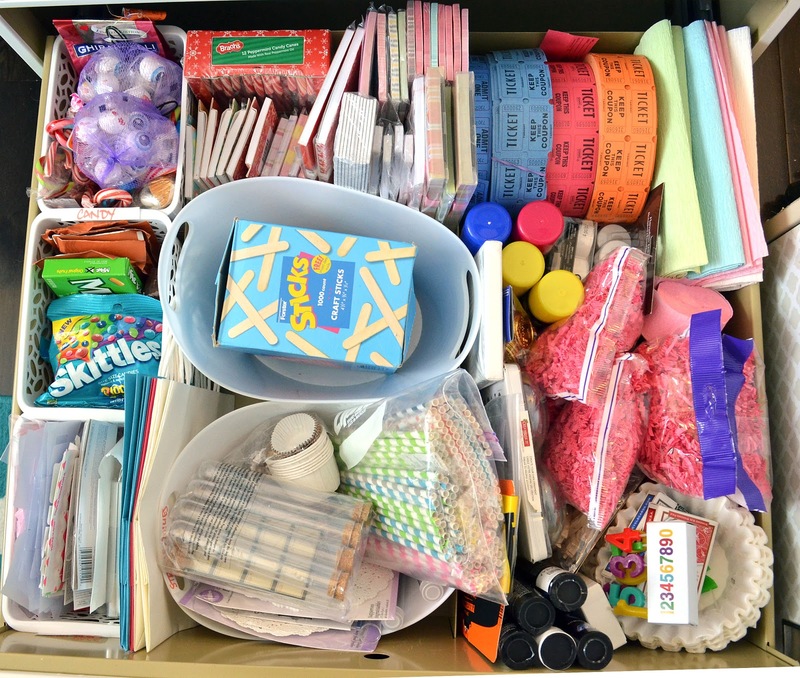 In the next drawer (which used to look like this), I've got mostly the same things as last time: ribbon, cork, yarn. 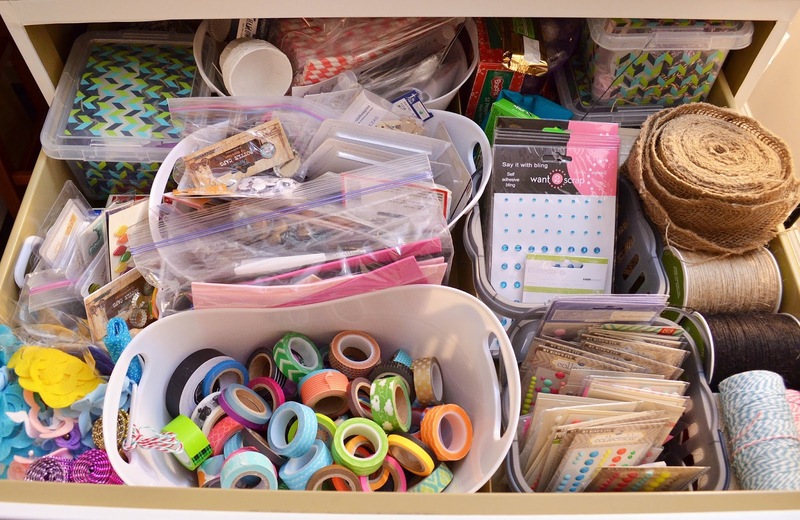 Again, I pulled a bunch of extras to donate and to put in the craft box for my nieces. 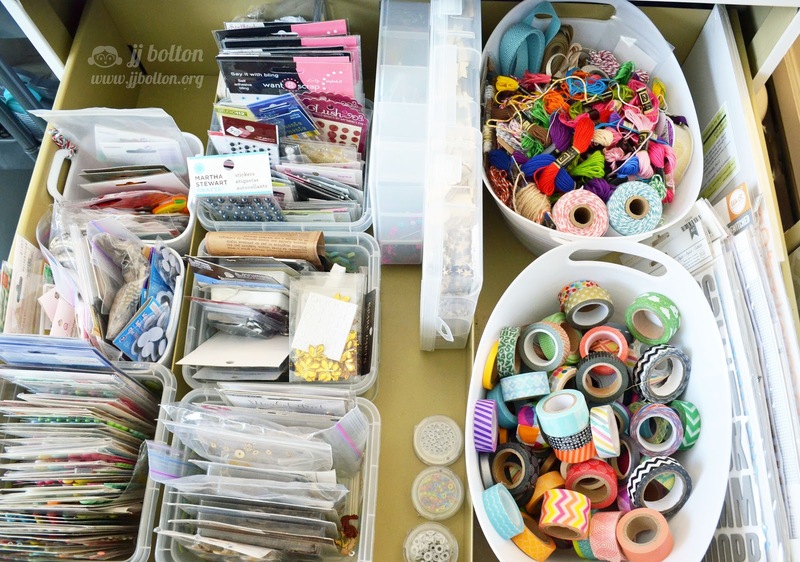 For little stuff like beads and buttons, I recycle stuff like spaghetti jars and gelato containers. I try to raid the recycle bin before I buy from the store. If I do buy, it's usually from Ikea, dollar store, or the dollar spot at Target. A note about containers. 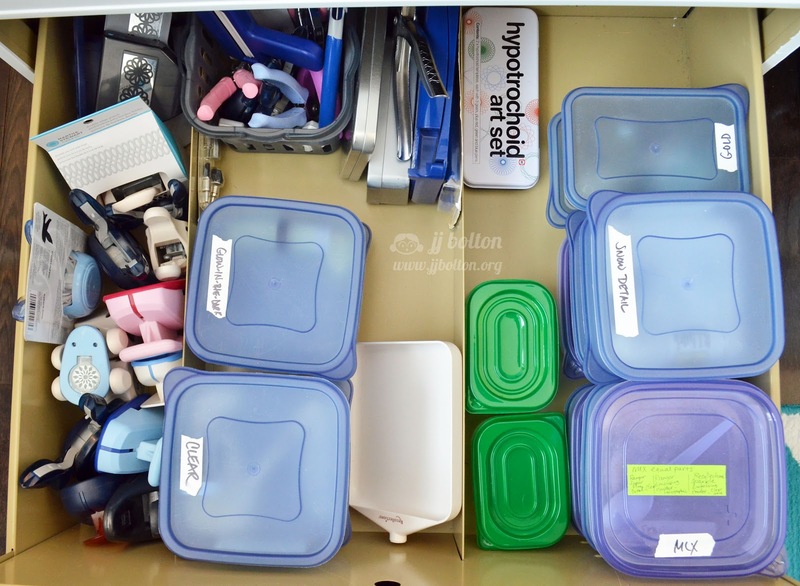 Take time to plan out where you are going to use them and buy a few extra (especially if they will be visible containers). Don't count on being able to go back and pick up a couple more. Even if they carry the same item, there can be slight differences from lot to lot. 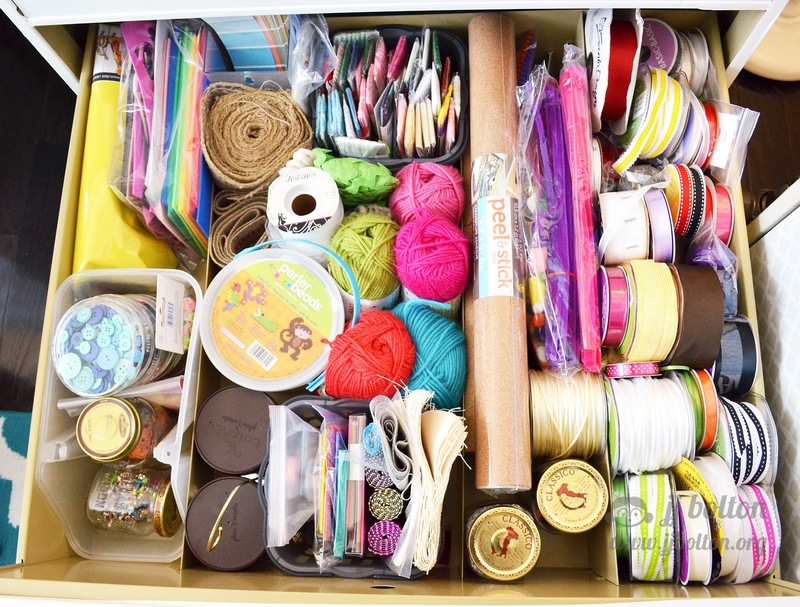 This last drawer is a new addition to the craft room. It used to be mostly empty, but it stores my party and gifts/favors stuff. Our new house has way more room to entertain than our last place, and we've been having folks over more frequently. And with kids and work, there's always an occasion for a card or gift. Having a place to store things means I can get better deals when things are on sale and I'm always prepared (in theory at least). That's it for today! it! Tomorrow, I'll be back to talk about storage challenges:) Have a great Monday!!! So many great ideas, JJ! Thanks so much for sharing them with us! I 'need' the ink storage unit in the worst way...signed up for their newsletter, and I'll watch for a sale...thanks! This is just a dream room! !